If you just can't bear another push-up, you're in luck! While push-ups are a great way to train your upper body, they aren't the only way. You can tone your arms, shoulders, chest, core and legs with alternative moves that use your body weight and easy-to-find equipment. Use a long latex resistance band or tube for this exercise. You'll work your pectoralis major -- the primary muscle activated during a push-up -- as well as the triceps at the back of your upper arm and the fronts of the shoulders. HOW TO DO THEM: Hook the band around a door jam or other stable, strong anchor and place one handle in each hand with your back to the anchor point. Bring the handles to chest height with your elbows in line with your shoulders. Walk forward one to two feet, or until your feel slight tension in the band. Assume a staggered stance for stability -- one foot slightly in front of the other. Push the handles forward until your elbows are fully extended. Release the press to return to the start position to complete one repetition. You'll need dumbbells or a barbell to perform this exercise. You choose the heaviness rather than having to bear a significant amount of your body weight. 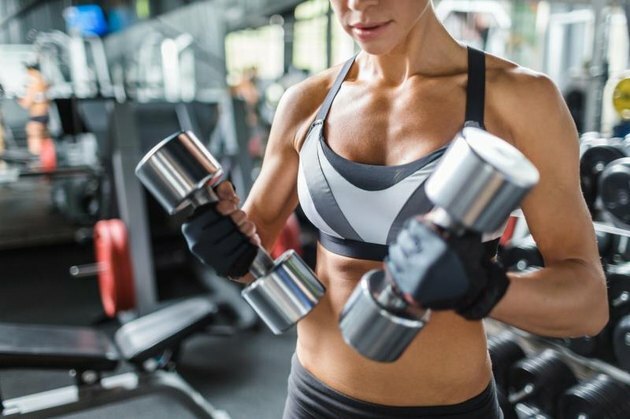 HOW TO DO THEM: Grab a dumbbell in each hand with an overhand grip and kick back so you're lying flat on a workout bench with the weights at your shoulders and elbows parallel to the floor. Alternatively, lie beneath a racked barbell and have a spotter hand the barbell to you; if the weight is light enough, you can un-rack it yourself from a reclined position. Extend your elbows to press the weight directly up toward the ceiling. Bend the elbows to return to the start position to complete one repetition. Bear crawls raise your heart rate, as well as strengthen your shoulders, quadriceps and core; all are areas activated by push-ups. HOW TO DO THEM: Get into all fours with your hands under your shoulders, knees under your hips and abdominal muscles braced. Lift your knees an inch or two off the ground and maintain this lift throughout the exercise. Move your right hand and right foot a few inches forward. Your left hand and right foot follow. Continue to alternate for the desired duration of the exercise -- usually across a gym floor or for 30 seconds at a time. Bracing your body in a plank position on your forearms takes pressure off sore or weak wrists, but still notably strengthens your core like you do during a push-up. HOW TO DO IT: Get into all fours with your elbows under your shoulders and forearms flat. Your knees should be under your hips. Extend your legs back one at a time so you form a straight line from your heels to your head. Brace your abdominal muscles as if you're trying to pull your belly button into your spine.Hold for 20 to 60 seconds at a time. Using a stability ball for this classic chest strengthening exercise creates instability, so your core has to work extra hard. You'll also engage your pectoralis major, again the muscle most worked during a push-up. HOW TO DO THEM: Grasp a dumbbell in each hand and rests the heads on your thighs as you recline back onto a stability ball. Walk your feet forward until your neck and upper back are supported by the ball. Lift your buttocks to avoid sagging through the hips. Raise the weights over your chest and allow the dumbbells to face each other -- your palms face inward. Open your arms until you feel a stretch in the chest muscles, usually when your arms are about shoulder-height or parallel to the ground. Avoid going deeper. Return the weights to the beginning position in a hugging motion to complete one repetition.